This article is an excerpt from Chapter 8, which is entitled “The Message of Fatima versus the Party Line“, from The Devil’s Final Battle. After the two parts which I have already explained, at the left of Our Lady and a little above, we saw an Angel with a flaming sword in his left hand; flashing, it gave out flames that looked as though they would set the world on fire; but they died out in contact with the splendour that Our Lady radiated towards him from her right hand: pointing to the earth with his right hand, the Angel cried out in a loud voice: Penance, Penance, Penance! And we saw in an immense light that is God: something similar to how people appear in a mirror when they pass in front of it a Bishop dressed in White we had the impression that it was the Holy Father. Other Bishops, Priests, men and women Religious going up a steep mountain, at the top of which there was a big Cross of rough-hewn trunks as of a cork-tree with the bark; before reaching there the Holy Father passed through a big city half in ruins and half trembling with halting step, afflicted with pain and sorrow, he prayed for the souls of the corpses he met on his way; having reached the top of the mountain, on his knees at the foot of the big Cross he was killed by a group of soldiers who fired bullets and arrows at him, and in the same way there died one after another the other Bishops, Priests, men and women Religious, and various lay people of different ranks and positions. Beneath the two arms of the Cross there were two Angels, each with a crystal aspersorium in his hand, in which they gathered up the blood of the Martyrs and with it sprinkled the souls that were making their way to God. The immediate reaction of millions of Catholics could be summarized in two words: Thats it? Clearly, something was amiss, since nothing in this text corresponded to what Cardinal Ratzinger himself had said about the Third Secret in 1984 — a point to which we shall return shortly. Nor did it contain anything that would have explained its mysterious suppression since 1960. Most important, this obscure vision, written down on four sheets of notebook paper, contained no words of Our Lady. In particular, it contained nothing that would complete the famous phrase spoken by Our Lady at the conclusion of the recorded portion of the Message of Fatima as faithfully transcribed by Sister Lucy in her memoirs: “In Portugal the dogma of the faith will always be preserved etc.” Sister Lucy had added this phrase, including the “etc.”, to her fourth memoir as part of the integral text of the Message. This addition had led every reputable Fatima scholar to conclude that it signaled the beginning of the unrecorded Third Secret, and that the Third Secret pertained to a widespread dogmatic crisis in the Church outside of Portugal. Clearly, the Virgin had more to say that was not written down because Sister Lucy had been instructed to keep it secret — until, as we have seen, 1960. Why are Sodano/Ratzinger/Bertone so leery of this key phrase that they would so obviously go out of their way to avoid it by using an earlier and less complete memoir of the text of the Message? If there is nothing to hide in this phrase, why not simply use the Fourth Memoir and attempt an explanation of what the phrase means? Why did the authors of TMF so obviously pretend that the phrase is a mere “annotation,” when they know full well that it appears in the integral text as part of the spoken words of the Mother of God? We shall return to this suspicious behavior in a later chapter (“Cardinal Ratzinger’s Message of Fatima“, Chapter 11 of The Devil’s Final Battle). in which Sister Lucy wrote down the words which Our Lady confided as a secret to the three shepherds of the Cova da Iria” — as the Vatican itself had described it in the aforementioned 1960 press release. The text of the vision spans four pages of what appear to be ruled notebook paper. Another suspicious circumstance is that on June 26 Cardinal Sodanos falsehood of May 13 was clearly exposed: the Pope is killed by soldiers who fire upon him as he kneels at the foot of a large wooden Cross outside a half-ruined city. The Pope is not “apparently dead”, as Sodano had falsely asserted in May; the Pope is dead. The vision, whatever it means, clearly has absolutely nothing to do with the 1981 assassination attempt. The faithful had already been duped in May, and now the process of duping them was clearly continuing. The dozens of discrepancies raised by this text – prompting Catholics around the world to doubt that we have received the Secret in its entirety – will be addressed in a later chapter. (See “Does the Third Secret Consist of Two Distinct Texts?“, Chapter 12 of The Devil’s Final Battle.) For now, we consider the Ratzinger/Bertone “commentary” in TMF on the Fatima Message as a whole. First of all, we must affirm with Cardinal Sodano that the events to which the Third Secret of Fatima refers now seem part of the past. Insofar as individual events are described, they belong to the past. Is it not curious that the interpretation of the Virgin of Fatimas vital message to the world had been given over, not to the Pope, nor even to the Congregation for the Doctrine of the Faith (which was merely aping Cardinal Sodanos opinion), but to the Vatican Secretary of State? What authority does Cardinal Sodano have to impose his view upon the Church? None, of course. But Cardinal Sodano had arrogated that authority to himself in keeping the overall post-conciliar ascendancy of the Vatican Secretary of State to the status of de facto Pope when it comes to the daily governance of Church affairs. Returning to the “commentary” with these facts in mind, one can see that the press conference of June 26, 2000 had one overriding purpose: to carry out Cardinal Sodanos order concerning the “correct” interpretation of the Message of Fatima. By the time the reporters left that room, the Message of Fatima — all of it — was to be buried. And once buried, the Message would no longer impede Cardinal Sodano and his collaborators in their relentless pursuit of the Churchs new, post-Fatima orientation, which includes (as we shall see) the important Church business of lauding, dining and hobnobbing at the Vatican with the likes of Mikhail Gorbachev, having the Pope apologize to the Red Chinese regime, pressuring Romanian Catholics to surrender to the Orthodox church the local Catholic Churchs rights to the properties stolen by Josef Stalin, supporting and even contributing money to a godless, unaccountable International Criminal Court under United Nations auspices that could try Catholics of any nation for unspecified “crimes against humanity,” and other such “triumphs” of Vatican diplomacy. I would like finally to mention another key expression of the “secret” which has become justly famous: “my Immaculate Heart will triumph.” What does this mean? The Heart open to God, purified by contemplation of God, is stronger than guns and weapons of every kind. The fiat of Mary, the word of her heart, has changed the history of the world, because it brought the Saviour into the world — because, thanks to her Yes, God could become man in our world and remains so for all time. The attentive reader will notice immediately that Cardinal Ratzinger has conveniently removed the first three words from the Virgins prophecy: In the end. This clearly deliberate censorship of the very Mother of God was necessary for Cardinal Ratzingers revisionist “interpretation” along the lines dictated by Sodano: namely, that Fatima belongs to the past. Thus, “In the end, My Immaculate Heart will triumph” is — after the expedient removal of the first three words — now to be understood as follows: “2,000 years ago My Immaculate Heart triumphed.” Our Ladys prophecy of what will happen in the end is blatantly falsified into a mere acknowledgment of what had already happened 20 centuries ago at the beginning of Christian history. 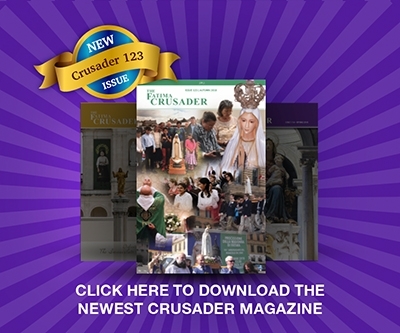 Four future events — the triumph of the Immaculate Heart, the consecration of Russia, Russias conversion, and the resulting period of peace in the world — are cunningly converted into one event 2,000 years ago! According to Matthew 5:8, the immaculate heart is a heart which, with Gods grace, has come to perfect interior unity and therefore sees God. To be devoted to the Immaculate Heart of Mary means therefore to embrace this attitude of heart, which makes the fiat — your will be done — the defining centre of ones whole life. Notice, first of all, the quotation marks Cardinal Ratzinger places around devoted and immaculate heart, which he strips of its upper-case I — a sure sign these words are about to acquire a new meaning. There is, of course, only one word to describe the demotion of the one and only Immaculate Heart – conceived without Original Sin and guilty of no personal sin whatsoever – to the level of the heart of any person who turns away from his sins and finds interior unity with God. The word is blasphemy. More will be said about this particular outrage in the next chapter (“Enforcing the New Orientation in a ‘Post-Fatima’ Church“, Chapter 9 of The Devil’s Final Battle). The conversion of Russia was a bit more difficult to make disappear. There is not much one can say to obscure the Mother of Gods very clear statement that “the Holy Father will consecrate Russia to Me, which will be converted.” But, as we have demonstrated abundantly, the conversion of Russia is no longer acceptable to the Vatican apparatus. The solution to this problem was simply to avoid any discussion of the subject in TMF, although Our Ladys words are quoted without comment. The conversion of Russia? What conversion? The crowning insult was Cardinal Ratzingers citation of only one “authority” on Fatima in TMF: the Flemish theologian Edouard Dhanis, S.J., whom Cardinal Ratzinger identifies as an “eminent scholar” on Fatima. Cardinal Ratzinger of course knows that Dhanis, a modernist Jesuit, made a veritable career out of casting doubt on the Fatima apparitions. Dhanis proposed that everything in the Secret of Fatima beyond a call for prayer and penance was cobbled together in the minds of the three children from things they had seen or heard in their own lives. Dhanis thus categorized as “Fatima II” all those things which the “eminent scholar” arbitrarily rejected as fabrications — without ever once interviewing Sister Lucy or studying the official Fatima archives. Dhanis deconstruction of the Message of Fatima is a typical example of how modernists undermine Catholic truths based upon premises they themselves invent. Since (invented premise) the consecration of Russia is morally impossible, how could Our Lady of Fatima have requested it? Having thus stacked the deck against Sister Lucy, Dhanis states the “inevitable” conclusion: “But could the Most Holy Virgin have requested a consecration which, taken according to the rigor of the terms, would be practically unrealizable? …This question indeed seems to call for a negative response. …Thus, it hardly seems probable that Our Lady asked for the consecration of Russia. …” Based entirely on the premise Dhanis invented, Sister Lucys testimony is pronounced a fraud. That is precisely the line adopted by Cardinal Sodano and his Vatican apparatus: the Mother of God could not possibly have requested anything as diplomatically embarrassing as a public consecration of Russia: and so we must do away with this embarrassing notion once and for all. And it is this line, the Party Line, which Cardinal Ratzinger endorsed in his “commentary” by praising Dhanis as an “eminent scholar” on Fatima. Cardinal Ratzinger, following the Party Line, suggests that the Third Secret in particular consists of “images which Lucia may have seen in devotional books and which draw their inspiration from long-standing intuitions of faith.” In other words, who can really say which parts of the Third Secret are authentic and which are merely personal memories or “intuitions”? And if that were true of the Third Secret, it would also be true of the rest of the Message of Fatima. What was left of the Message of Fatima after Cardinal Ratzinger and Bertone got done with it on June 26? On this point, Cardinal Ratzinger, Msgr. Bertone, and Fr. Dhanis all agree: “What remains was already evident when we began our reflections on the text of the secret: the exhortation to prayer as the path of salvation for souls (sic) and, likewise, the summons to penance and conversion.” On June 26, 2000 the Message of Fatima became Fatima Lite: a watered-down prescription for personal piety without any specific relevance to the future. For this the Mother of God came to earth and called down the Miracle of the Sun? It is interesting to note that even in presenting this minimalist version of the Message, Cardinal Ratzinger could not write about salvation for souls without bracketing those words with the same squeamish quotation marks he used to distance himself from the words devotion, triumph and immaculate in his commentary. It seems even Fatima Lite is not quite light enough in Catholic content for the ecumenical palates of modern churchmen. As for Our Ladys prophetic warning that “various nations will be annihilated” if the consecration of Russia were not done, this we are apparently supposed to forget. There will be no annihilation of nations, “Fatima is all in the past.” Cardinal Sodano says as much. Cardinal Ratzinger agrees. For more about the Party Line on the Consecration of Russia and the Third Secret of Fatima, see the remaining sections of Chapter 8 of The Devils Final Battle. 1. Dhanis’ entire thesis against Fatima is explained and critiqued in Frère Michel de la Sainte Trinité, The Whole Truth About Fatima, Volume I: Science and the Facts, (Immaculate Heart Publications, Buffalo, New York, U.S.A., 1989) Part II, Chapter 1. All quotations concerning his false theory are from this source.